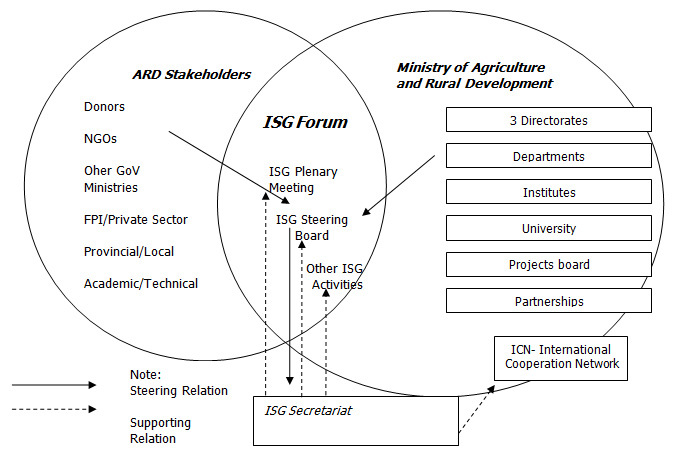 The ISG structure can be described as a 'meeting space' between MARD and external stakeholders that provides a forum for policy dialogue and exchange of information and experiences in the ARD Sector. In this space, the ISG Plenary and other workshops, forums and communications tools are the mechanisms for stakeholders to facilitate this exchange. The ISG Steering Board meets to set the direction and focus for the ISG group to pursue, while the ISG Secretariat, under the management of MARD-ICD facilitates and organizes all ISG activities. ISG Plenary Annual highest-level body and open to all stakeholders. It is chaired by Vice Minister, Dr Bui Ba Bong. It provides an open thematic forum for briefings and exchanges between all ARD stakeholders on MARD's current development policies. ISG Steering Board The Steering Board meets twice per year and consists of members from MARD and donor organizations. They outline the policy framework for ISG and select thematic issues for the ISG forum to focus on, as well as reviewing and approving plans and budgets. ISG Secretariat The ISG Secretariat facilities and organizes all ISG activities and is responsible for coordinating the communications and stakeholder networking of the ISG group. It is under the direct management of the ISG Director who is also the director General of the International Cooperation Department of MARD. The Secretariat comprise permanent contracted staff. Short-term national and international consultants can be mobilized when needed for specific tasks and assignments as approved by the ISG Steering Board. International Cooperation Department The ICD is the advisory and general Management unit to the Minister of MARD in matters of international cooperation and international economic integration in the ARD Sector. It takes the leading role in coordinating with donors and other relevant agencies and NGOs in preparing, appraising and negotiating ODA and FDI projects and programs in Vietnam’s ARD Sector. 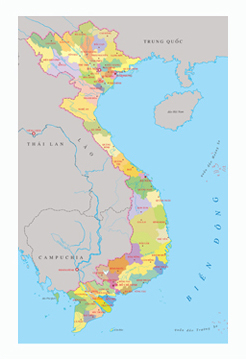 ICN Network The Vietnam International Cooperation Network of Agriculture and Rural Development (VICNARD) is a network of members from various staff of MARD departments, institutes and universities. The network aims to strengthen MARD international cooperation efforts through regular dialogues, information exchange activities and short term training courses. The ISG secretariat also works to perform the functions and tasks of the ICN network.